The Rare Book Collection’s Flickr site passed two milestones this summer, reaching over 3,000 images and over a million views. The site also sports a number of new albums that are worth pointing out. 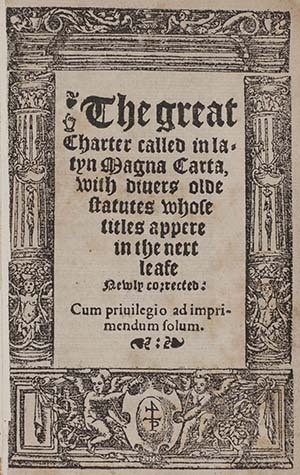 In conjunction with the 800th anniversary of Magna Carta, the Magna Carta album features many of our editions of Magna Carta, volumes including Magna Carta, and commentaries on Magna Carta by authorities such as Bracton, Blackstone, and Coke. There is a miniature 14th-century manuscript of Magna Carta, our earliest printed edition (shown at left), and a 1965 5-cent U.S. commemorative stamp. The album is a work in progress, so stay tuned for additions. My library colleagues have mounted an excellent and informative exhibit, “Magna Carta: History, Legacy and Idea,” in the library’s main reading room. It is on view until October 31 and well worth a visit. 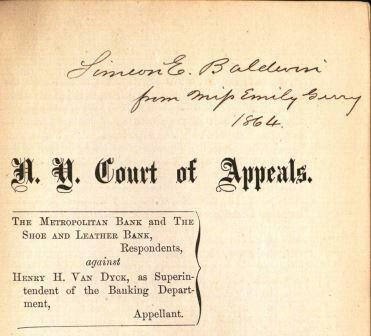 Women printed, donated, and owned law books – from manuals to treatises to codes – long before women entered legal practice. 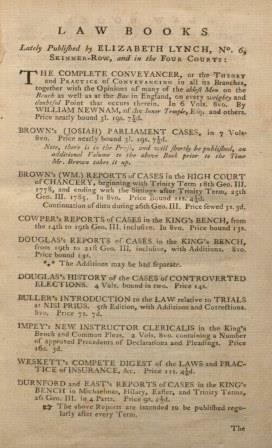 From queens to unknown women, from the fifteenth to the nineteenth centuries, this exhibit provides a glimpse of women’s involvement with law books both inside and outside of official structures. 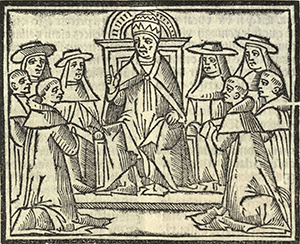 The exhibit, “Evidence of Women: Women as Printers, Donors, and Owners of Law Texts,” is curated by Anna Franz (Rare Book Fellow, Yale Law Library). It is on display through August 25, 2015, in the Rare Book Exhibition Gallery, located on Level L2 of the Lillian Goldman Law Library, Yale Law School (127 Wall Street, New Haven, CT). This exhibit provides further evidence of women’s long involvement with the law even at times when they could not practice it. Since the exhibit represents only a small sampling from the vast corpus of law texts, it prompts reflection on the potential depth and breadth of women’s interactions with the law as producers, transmitters, and consumers, instead of as objects or eventually practitioners of law. It especially highlights women’s importance in the dissemination of law texts through their substantial and sustained role as printers and sellers of law books. For more information, contact Anna Franz at (203) 432-5678, email anna.franz@yale.edu, or Mike Widener at (203) 432-4494, email mike.widener@yale.edu. 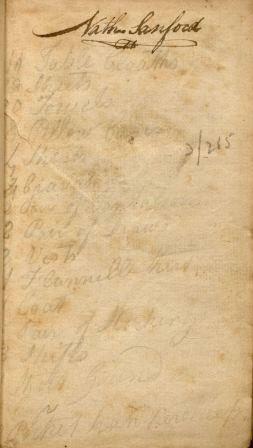 Practica de testamentos was first published in Manila in 1745. Our 1755 edition was the first of a dozen editions published in Mexico City, the last one appearing in 1869. It was one of the earliest books printed in New Mexico, with editions printed in Santa Fe in 1850, 1870, and 1884. 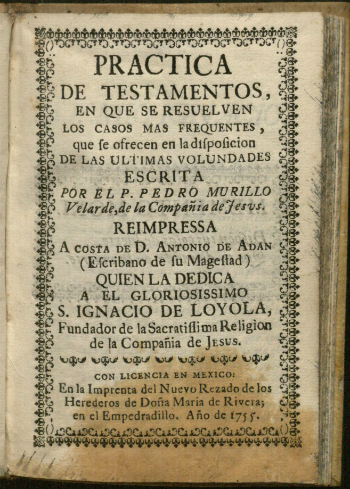 It was also published in Guatemala (1753) and Buenos Aires (1792). The author, Pedro Murillo Velarde (1696-1753), was a Jesuit priest who spent almost his entire career in the Philippines. He served as professor of canon law and theology in the University of Manila, as well as in numerous offices with the Jesuits. 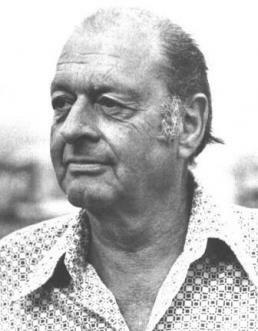 Murillo Velarde was a prolific author. His two-volume Cursus juris canonici, hispani, et indici, a textbook on canon law as practiced in Spain and its overseas empire, was considered the best 18th-century Spanish treatise on canon law. It was published in Madrid in 1743, 1763, and 1791. Murillo Velarde also authored an impressive ten-volume Geographía historica (Madrid, 1752). His map of the Philippines, Carta hydrographica y chorographica de las Yslas Filipinas (Manila, 1734), described in a June 9, 2015 CNN report as the “Mother of all Philippine maps” and the “Holy Grail of Philippine cartography,” is being submitted to the International Tribunal for the Law of the Sea in The Hague as evidence by the Philippines in a dispute with China over islands in the South China Sea. Que te dén vida en la muerte.